Join CIDAA now and start receiving the CIDAA Newsletter, a complete membership roster, and other great "networking" benefits. The "Gold Book" roster is shown at right. 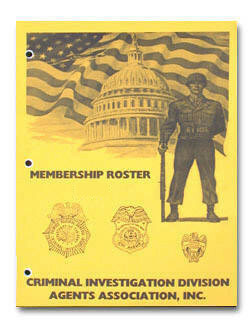 Membership in CIDAA is open to any person who is or was accepted for and assigned to active duty for a period of not less than six consecutive months as an accredited Agent in the Criminal Investigation Division of the Army of the United States, and was awarded the Military Occupational Specialty (MOS) OR the Department of the Army Civilian Occupational Code as an Agent in the Criminal Investigation Division of the United States Army. This includes Active Duty, Reserve, Retired and Former U.S. Army CID Agents. Documentary proof of honorable service with the U.S. Army CID, or current valid accreditation with CID as a reservist, is required during the membership application process. Associate Membership is available for USMC Special Agents and for some CID Staff members... contact the Membership Chairperson for additional information. Click here to see the CIDAA Application form. Note: Some versions of Internet Explorer and some plug-in helper and/or security settings have problems with PDF files. This is an error which may be fixed in a future version of Internet Explorer. Until then, the easiest fix is to "right-click" on the file you file you want to download (such as the word "here" above), save the file to your desktop or another location, then open outside of Internet Explorer. Click here to see the PMG badge.